Grady “The Professor” Mathews once said, “Pool is 70 percent mental.” Over years of play, you have probably made enough poor decisions to believe this is true. Why, then, do we associate our playing ability with physical skill? It’s because our physical abilities are easier to see than our thought processes. In reality, the best players in the world are often much more deliberate in the way that they think than amateur players. 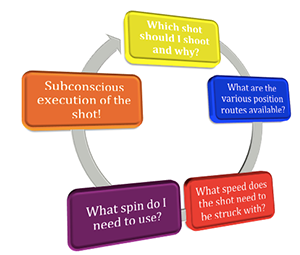 Professional players build their decision making process into their pre-shot routines. In fact, they are masters at separating their thought processes from executing the shot at hand. So what is the correct decision making process? The first step is to stand far enough away from the table that you are able to see the entire layout of balls. If you stand too close then it becomes impossible to see the relationship one ball has to another. This impairs your ability to make quality decisions. The second step is to separate your conscious mind from your subconscious mind. One way to do this is by using your chalk as a triggering mechanism. Each time you approach the table you should pick up the chalk to begin your thought processes. The best way to explain this is to pretend that your chalk is your brain. Make it a rule that you are not allowed to make any decisions or think about anything game related unless you have the chalk in you hand. 1. Which shot am I going to shoot and why? 2. What are the various position routes available for my next shot? 3. What speed does the shot need to be struck with to get to the desired location? 4. What spin do I need to strike the cue ball with to execute the shot properly? Once all of your decisions have been made you should place your chalk back onto the table (or put in in you pocket). This will act as a trigger to your brain that you are now ready to stop thinking and execute the shot. Once you are down on the shot, you should try not to think about the decisions that you made standing with chalk in hand. Your only job is to execute the shot you decided on subconsciously. If at any time you start to second-guess yourself or any part of your plan, you should stand back up, pick up the chalk and start the entire process over again.